Red Bull team boss Christian Horner says his squad remains committed to cost control regulations despite withdrawing from the Formula One Teams' Association (FOTA) amid the impasse over the Resource Restriction Agreement (RRA). Ferrari, Red Bull, and Sauber have all announced their departure from the teams' body, with Toro Rosso understood to have done likewise, as the group failed to find sufficient common ground in the debate over the spending limit. Horner said he had no qualms about Red Bull's decision. "FOTA did a lot of good things when it was first created," he said. "It focused on saving costs. In recent months, it has been less effective and more fractured in the way of thinking of how FOTA should move forward and what it is responsible for. "We have made the decision to step out of FOTA for now and we will keep a watching brief on how things evolve. But for the time being, we are happy to be in control of our own destiny as opposed to FOTA." Horner underlined that it was the nature of the RRA, not the concept, that had caused Red Bull's frustrations. Rival teams had suspected that Red Bull had been pushing the boundaries of the agreement, while Red Bull was concerned that manufacturer teams could exploit loopholes such as engines not being included in the limit. 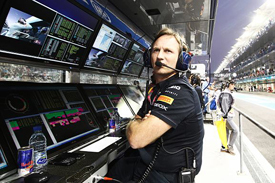 "It needs to encompass all aspects of the car," said Horner. "Dealing with equivalence is always quite dangerous. Each of the teams has a different make up, different ownership. "Some belong to motor manufacturers and some are independent and if you look at the things that work, like the testing, like the windtunnel hours, like the restriction in personnel, the things that you can touch and feel work quite well. But as soon as you start trading equivalence of hours versus external spend, that's where it seems to run into some difficulty. "There's a willingness from all of the teams to try and contain costs, it's just the manner that you do it. And you can't exclude the engine from that with some teams producing their own engines, so it's important to look at the teams as a whole rather than cherry-picking the chassis." Red Bull's technical chief Adrian Newey echoed Horner's stance. "We all agree with budget control, we don't want to get into the arms race that happened with the manufacturers a few years ago and certainly with Red Bull we wouldn't be able to," Newey said. "But if we can concentrate on the things that are tangible, the windtunnel and CFD restriction works very well because you can measure it. Testing restrictions are exactly the same. "But with some of the teams involved being subsidiaries of major automotive companies, it becomes a bit difficult to know exactly how their resources are split. It's about transparency, it's about having things that you can genuinely measure. As soon as you can't have that you get all of the accusation." Horner added that he did not rule out Red Bull returning to FOTA within the two-month notice period that departing teams have to serve. "There is a two-month notice period and both Ferrari and ourselves have served notice," he said. "Sauber have joined that now. We have a meeting with some of the other FOTA members on Monday to talk about cost control, but we'll see. "Nothing is ever totally set in stone but for the time being we felt that it was the right decision to take to step out of FOTA."